Just like the PlayStation Portable before it, the PlayStation Vita comes in iterations. There's the standard, original Vita, and then there's the new, even nicer version. Sony unveiled that new iteration recently at a Japanese event, and we got our first hands-on with it today at Tokyo Game Show 2013. So, what's different? Not too much. As it turns out, it's still a Vita. The good news is that it's a far lighter, more comfy version of the Vita you already know and (maybe) love. Rounded edges make holding the Vita distinctly less abrasive -- the sharper angles on the original Vita were pretty from a design perspective, but not so much from an ergonomic standpoint. The buttons have been rejiggered as well, with a solid click for each (the start / select / PS Home buttons are also all now circles instead of ovals). And hey, the micro-USB port for charging is an unbelievably welcome addition. Gone are the days of your proprietary Vita charging cable (though there's still a port for it as well, should you refuse to change). And that's not the only ergonomic improvement: the new Vita is dramatically lighter than its predecessor, making it all the easier to take on-the-go. We're told that its battery life is also much improved, but we've yet to see that play out in real life, so we'll reserve judgment for now. Update: We've added video just below walking through the new Vita -- please excuse us, as we called the new Vita's LCD screen an LED in the video. Chock it up to jet lag! Check out all our Tokyo Game Show 2013 coverage right here at our hub! As for that new LCD screen, it looked perfectly fine to us. 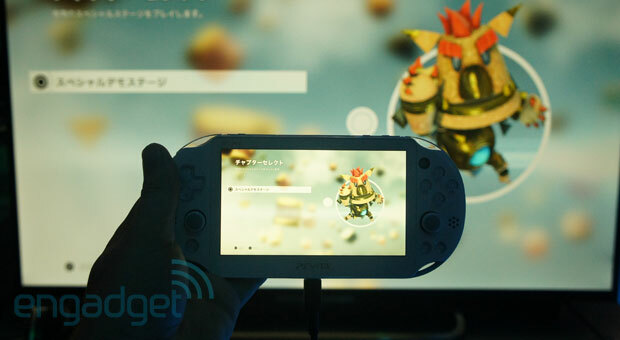 Games still looked great; in fact, we tried out PlayStation 4 Remote Play functionality on the new Vita with Knack, and it looked incredible. Of course, it's a PS4 game running on a little LCD screen, so it'd better look pretty incredible. Remote Play functionality was similarly impressive. There was zero perceptible lag between PlayStation 4 on-screen action and what we were inputting on the Vita. The same sentiment applies to input directly on the Vita for the PS4 game we were playing: no lag, as if Knack were a game being played locally on the Vita. How this will play out with your own home WiFi is another question altogether, which we'll test more thoroughly when we get PlayStation 4 review units in the coming weeks. As of right now, it more than stands up to NVIDIA's Shield. If anything, it bests the Shield's streaming performance with zero hitches while we played. Bizarrely, Sony still hasn't said if the new Vita's headed to territories outside of Asia, though it seems a given (especially given Sony's past iterations of the PSP). For now, the nicer, lighter, longer-lasting Vita is exclusive to Asia, but we have no doubt Europeans, Americans and the rest of the world will want one as soon as they get a taste of the new version. It arrives in Japan on October 10th for 18,980 yen (about $190). Mat Smith contributed to this report.